For a long time, I considered India too intimidating. Too crowded, too poor, too confronting, too likely to make me sick. But then, so many people I knew had visited and raved about it that I figured it was time I took the plunge. I convinced my mate Tan to join me on a twelve day tour through northern India. Why a tour? Well, we liked the safety net of having a group around us and a leader to smooth the rough edges and deal with all the logistics for us. With limited time, we wanted to make sure we saw the true highlights in each place we visited. We also loved that the group size was small (they take a maximum of 16 – our group was just 13). 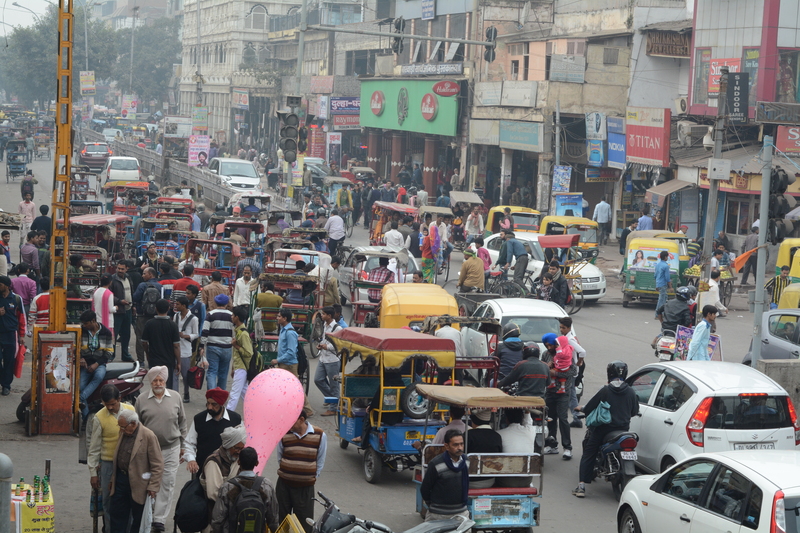 We started in Delhi with a walk through Old Delhi. When we emerged from the station, it was like we had gone back in time. An oxcart trundled down the street. Electrical wires tangled together overhead. It was dusty and smoggy and brimming with life. 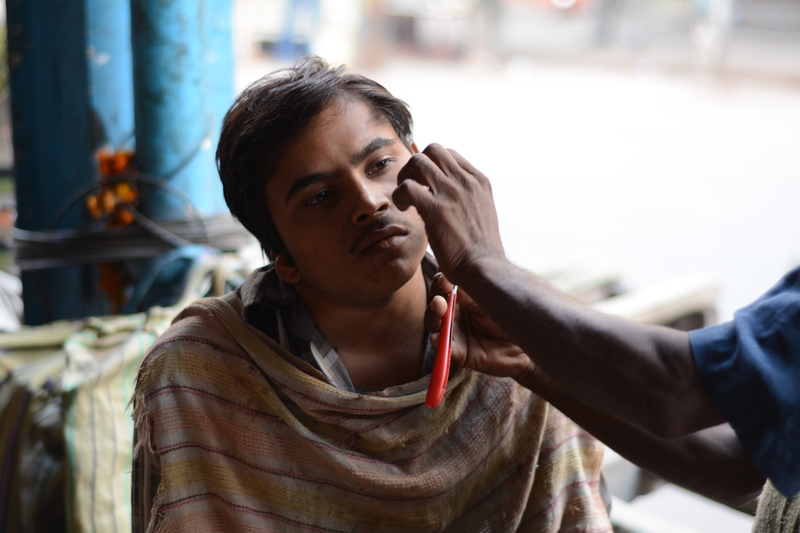 A young man received a cut-throat shave on the footpath. 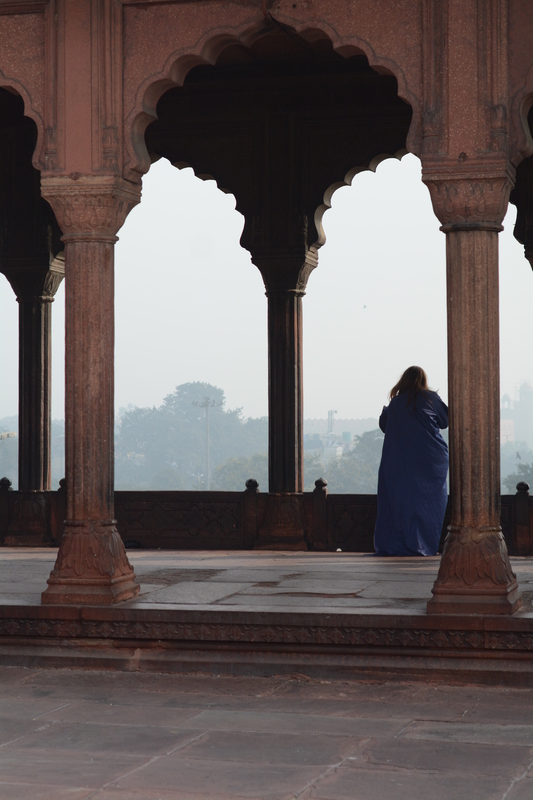 At the Jama Masjid mosque, wearing billowing gowns over our clothes, we gazed out over the rooftops of Old Delhi, through a smoggy haze. Children followed us, giggling, wanting us to take their photo. At the Sheeshganj Gurudwara Sikh temple, we sat in contemplation, then went into the kitchen where thousands of meals are prepared every day for free. 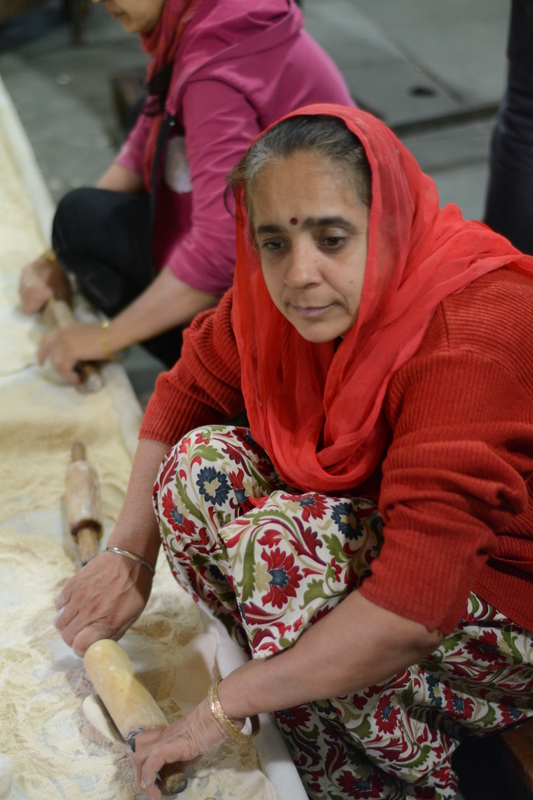 We watched small mountains of chapatis being rolled and cooked, in readiness for lunch. Getting a shave on the street. As you do. 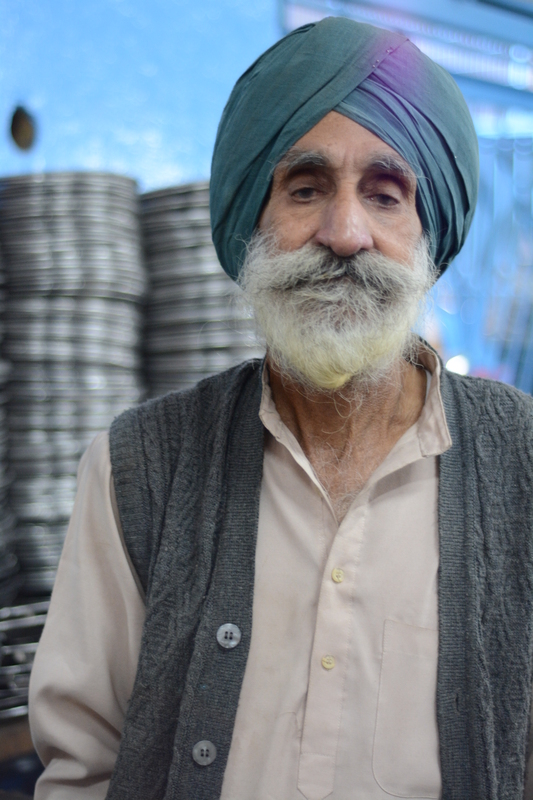 This magnificent chap was in charge of the meal trays at Sheeshganj Gurudwara temple. 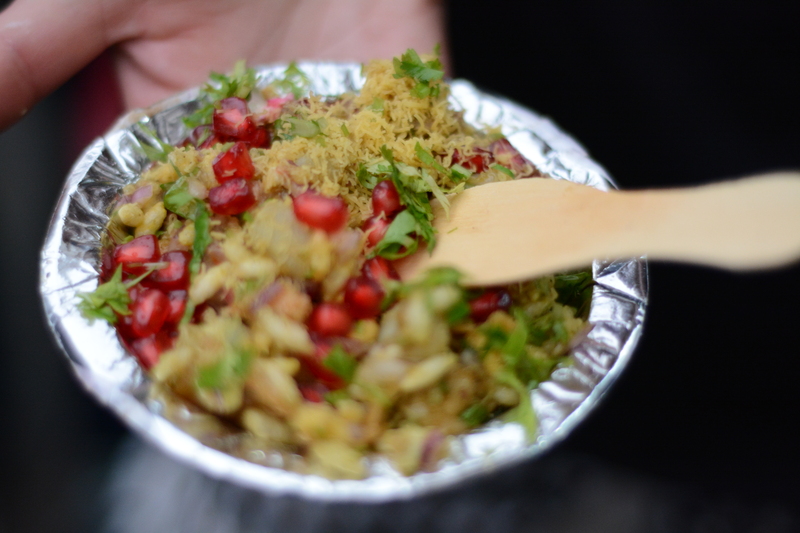 In the afternoon, we took our leader’s advice and did a street food tour through the university area of Delhi. This was absolutely the best way to experience this area, and to test the street food, with the safety of knowing we weren’t going to regret it 24 hours later. 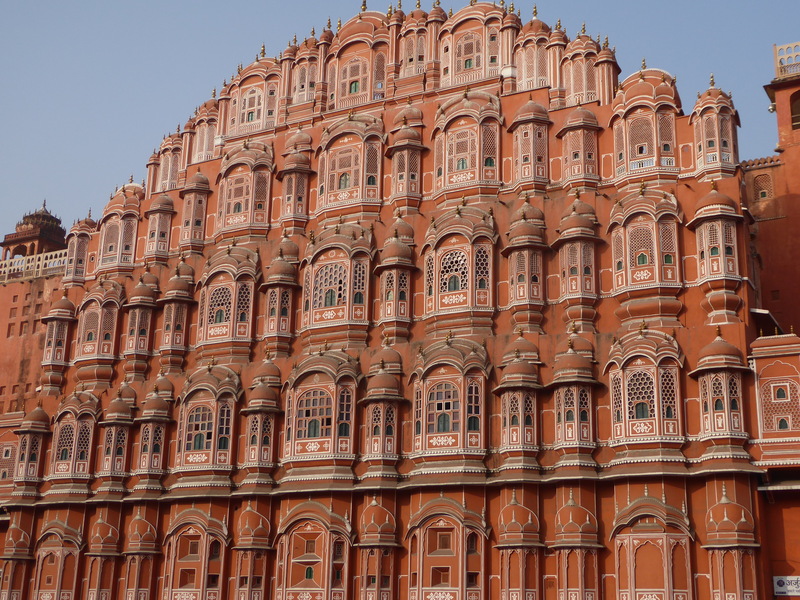 In Jaipur, the Pink City, we climbed steep steps – dodging elephants, monkeys, sleeping dogs and cavorting goats along the way – up to the Amber Fort, where the maharaja lived with his twelve wives and numerous concubines. He was a busy guy. We marvelled at the Palace of the Winds, an enormous facade from behind which the women would watch festivities in the street. And we were amazed by the intricate workings of the Observatory – a collection of huge marble instruments for telling the time, before watches were in fashion. Huge sun dials towered over us and told the time with incredible accuracy. At an ornate theatre, we watched a Bollywood movie starring the controversial Salman Khan (he had been on trial for a culpable driving incident). It was all in Hindi, and luckily there was an intermission when our wonderful leader Ajay explained the plot to us, with limited success. 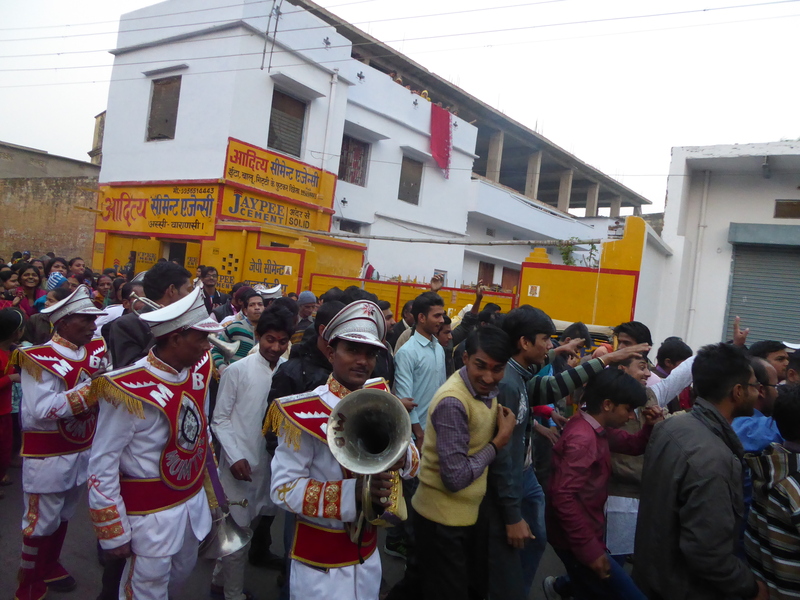 It was a true spectacle though, and judging by the laughter from the locals, there were plenty of jokes as well. 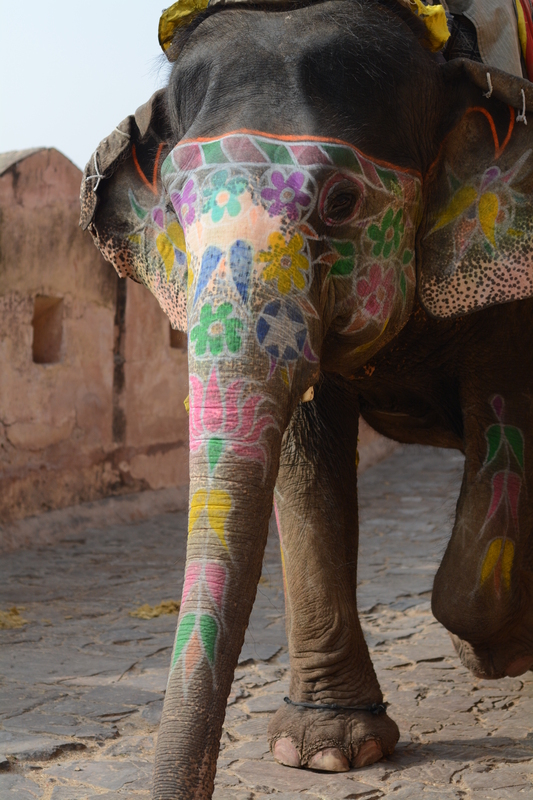 Nothing beats a floral elephant! Agra is all about the Taj Mahal of course. 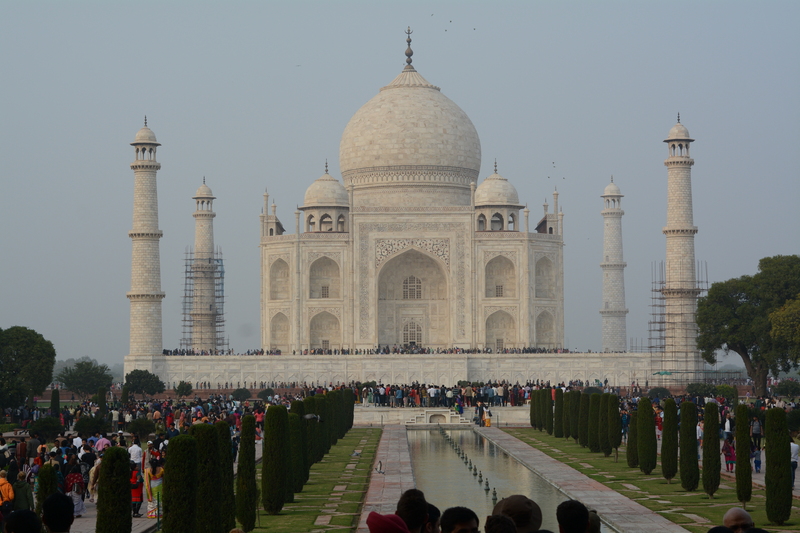 Ticking that one off the bucket list is pretty much the main reason millions of people visit Agra every year. 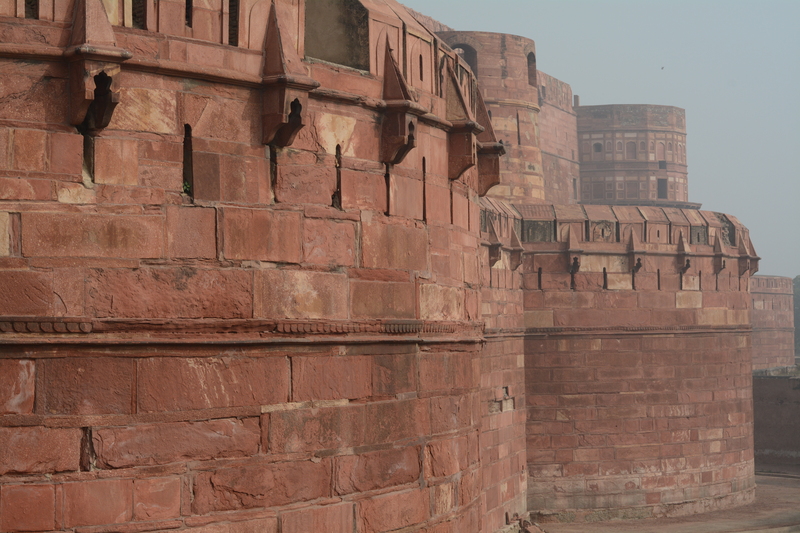 But we were pleasantly surprised by our visit to Agra Fort, a complex of fortified palaces and extravagant buildings. Shah Jahan, who built the Taj Mahal, lived and was ultimately imprisoned (by his own son, no less) and died here. Our guide painted an incredible picture of the opulence that was once the norm here. Carpets hung on the walls and lined the marble floors, and the walls were literally encrusted with jewels (long since stolen). And on a clear day, you can see the Taj Mahal floating in the distance (it was barely visible on our visit). The Taj is everything you expect it to be. It’s a spectacular testament to Shah Jahan’s love for his wife Mumtaz and without a doubt, one of the fancier tombs going around. There were thousands of visitors there – I expect that’s normal! So getting that money shot was a bit difficult. You had to resign yourself to the fact that every picture was going to have teeming crowds in it. As foreigners who had paid the premium ticket price, we got to jump the queue (this happens at a lot of tourist attractions) which meant that we walked straight into the tomb, while the locals queued literally around the entire base of the Taj. Once inside it was a mad jostle to glimpse the white marble tombs of Mumtaz and Shah Jahan before leaving the interior, all the while wearing shoe coverings that made us look like we were going into surgery. To be honest, there’s not that much to see inside and you can’t take photos, but if you like the feeling of being pushed and shoved combined with a high likelihood of falling over (we actually saw a woman trip, flat on her face, right in front of us) then it’s highly recommended. 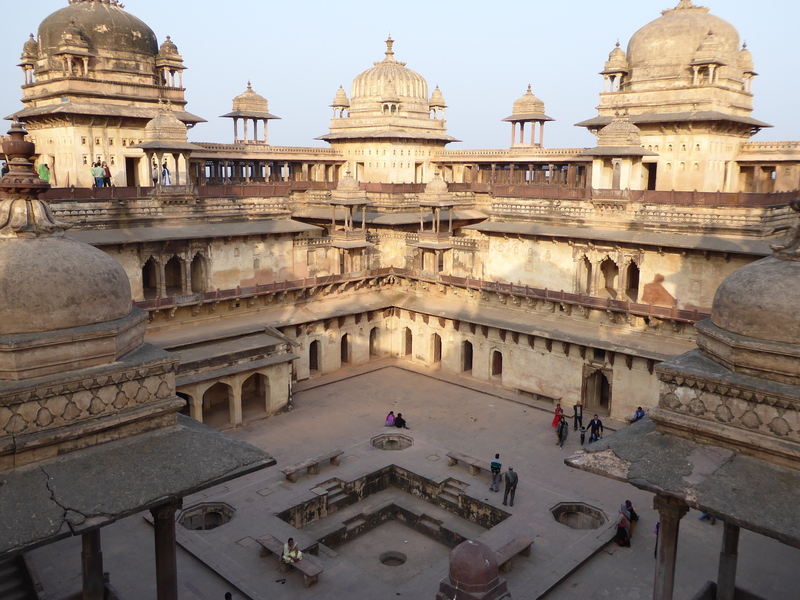 Our next stop was Orchha, a small town that gave a little insight into regular life in rural India. We stayed at a rather rustic resort (read: no hot water, rock hard beds, and worst of all THEY RAN OUT OF GIN!) but what it lacked in creature comforts, it made up for in atmosphere. Ajay took us to a Hindu temple where we were lucky to spot a double wedding with two exquisitely beautiful, but frankly terrified brides and two swaggering grooms. 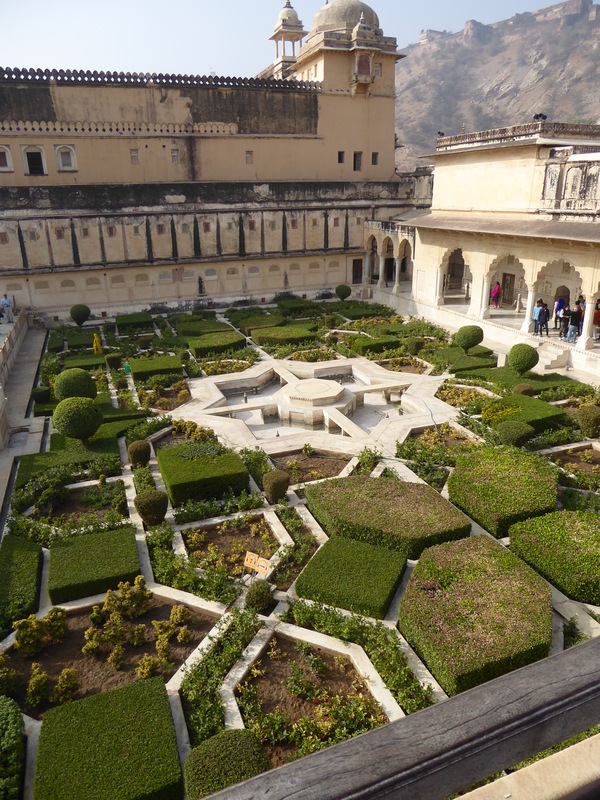 We visited Orchha palace – built for the Mughal ruler Jehangir, who spent the sum total of ONE WHOLE NIGHT there. And it was never used again. I know. 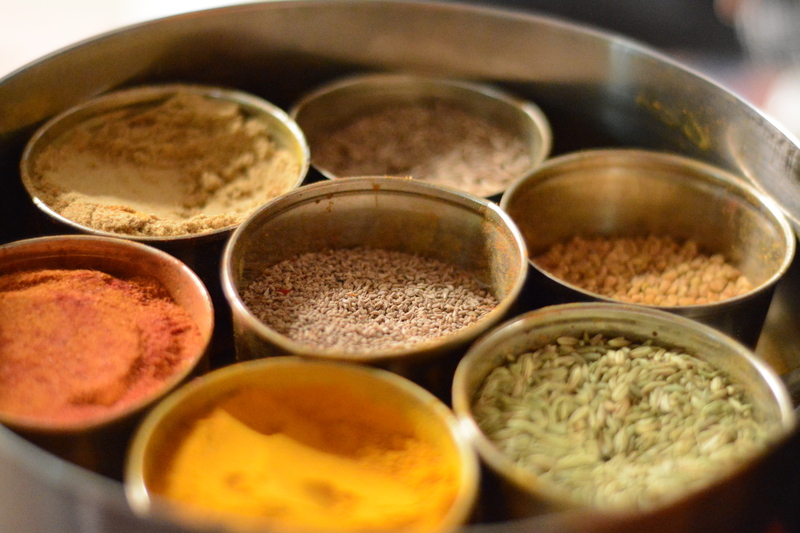 A real highlight of our time in Orchha was a cooking demonstration in the home of Vandina. She prepared a veritable feast for us, giving us recipes and cooking tips along the way. She was a magnificent hostess and her cooking was sensational. Now I just have to try and replicate her recipes. Our hostess not only cooked, she was a henna artist too! The town of Khajuraho is famous for one thing: a bunch of temples with carvings of the Kama Sutra on the outside (although to be fair, the raunchy carvings only constituted about 5% of all the carvings, but they definitely stand out – particularly the one with the horse!). 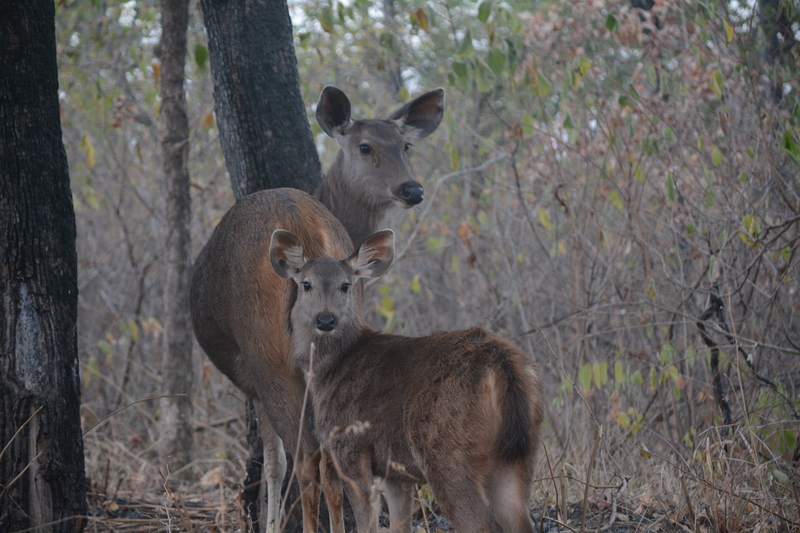 Early one morning I opted to go tiger hunting at the Panna Tiger Reserve. And by hunting, I mean, spotting and hopefully photographing. It was incredibly cold – I had tights, jeans, two tops, a jacket, gloves (thanks to Julia from Washington DC) AND a blanket and I was still bitterly cold. We bounced along in the back of a jeep through the reserve. 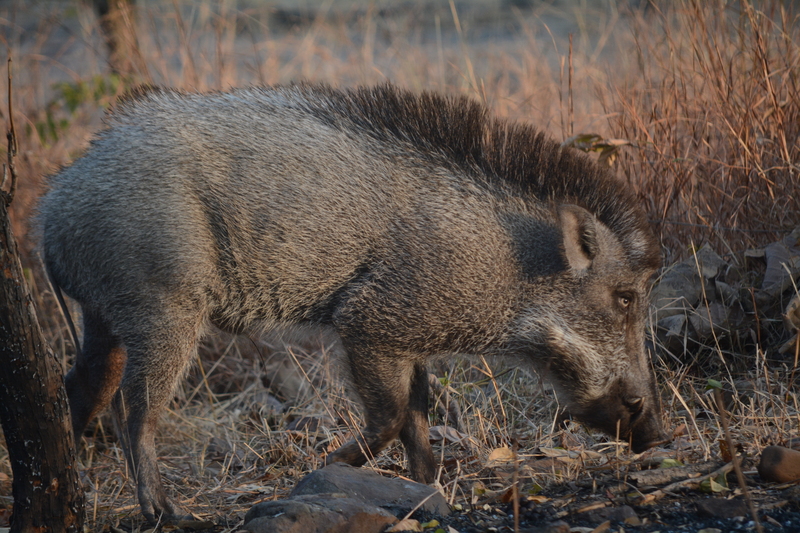 We spotted a lot of deer and antelope, a greedy warthog, a peacock, monkeys, crocodiles and a jungle cat. But no tigers. I was ok with that, because it was still incredibly beautiful. It was fascinating watching our guides listening and looking out. They heard a deer’s alarm call and instantly stopped, and listened so intently. They were pretty sure there was a tiger hanging around, but he was well hidden. By the river, we met a guy who lived there and eked an existence by selling masala chai to freezing tourists. I could have hugged him. 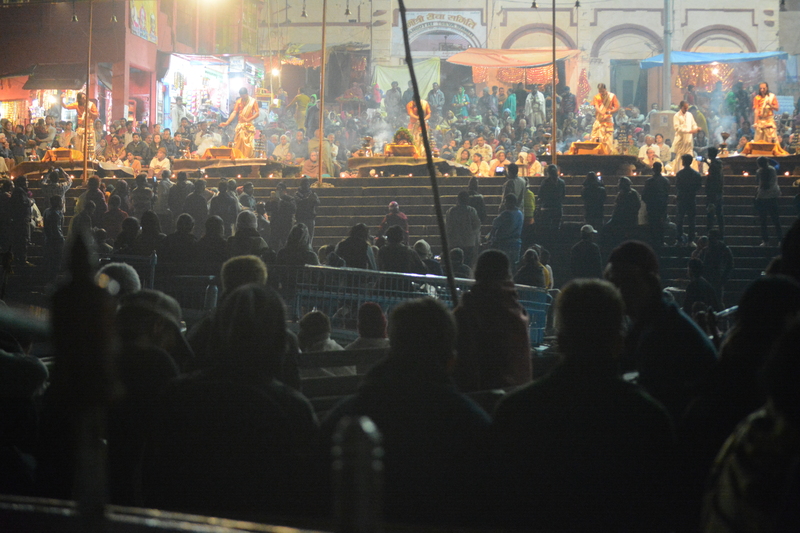 Varanasi is the holiest of cities for the Hindu religion and it’s a cacophony of chaotic action. Bodies swathed in orange cloth and festooned with flowers are carried through the streets on stretchers. Beggars are omnipresent. Cows roam the streets, completely oblivious to the constantly beeping horns and tuk tuks careering past them. At one of the ghats along the Ganges I even saw a cow walking down stairs, which I had long believed was not physically possible. The cows of Varanasi are indeed special. We cruised along the river in the evening to the Dashashwamedh Ghat where thousands of people watched on as several Hindu priests performed holy rituals. It was extraordinary to see the sheer number of people in boats observing the ceremony. We cast little floating candles into the holy river and made a wish. I’ll let you know if it comes true. At dawn, we cruised again watching the sun come up over a milky horizon. Hindu devotees bathed in the waters, building up some good karma. Laundry workers pounded wet washing on slabs set in the river with incredible vigour. Firewood arrived by boat at the burning ghats (there are two of them) where cremations happen from dawn till dusk. We walked through the old town and visited a textile store where the owner gave us a lesson in picking real silk and cashmere, before selling us a truckload of his finest goods. Varanasi is famous for its hand loomed textiles, so it seemed like an appropriate souvenir. Our adventure was filled with fantastic food (so much naan! ), an incredible amount of culture and thanks to Ajay, a real insight into the regular life of the locals. One night in Orchha we sat around a fire and he told us about arranged marriages and how they worked, using his own as an example. I felt extremely privileged that he shared his story with us. I’ll definitely go back to India. It turns out that it’s not nearly as terrifying as I anticipated. It’s chaotic and grubby and old and intriguing and, at times, mystifying. But it’s grabbed me. It’s under my skin. And there’s so much more to see. This is a great article. Your experience in India was great.